If a thug were to accost you in the street and demand your wallet or purse, you wouldn’t hesitate in knowing what to call it – theft! If a group of thugs were to demand at least one third of your income every month and threaten dire consequences if you didn’t accept their offer of “protection”, you wouldn’t hesitate in knowing what to call it – theft! Yet you are robbed every day. Every month at least one third of your income is taken from you forcibly, without your consent. It is taken by the government. And yes, even if only a few realise it, that too is theft! 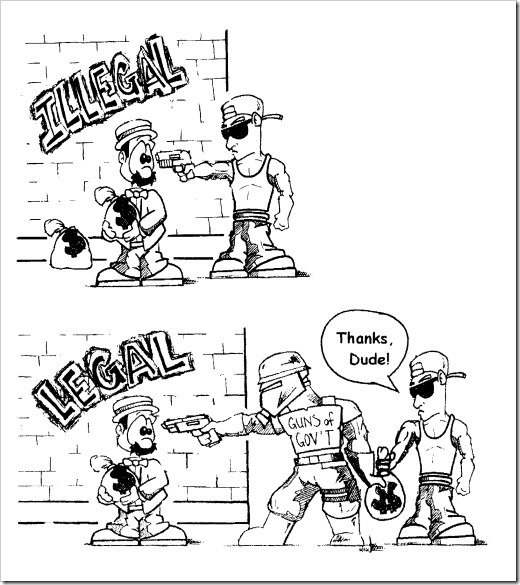 For just how does government differ from a mugger? Why is the state’s “protection” racket different from that of any other gangster? Both conform to my dictionary’s definition of theft – the seizure of individuals’ property without their consent. The only difference is that the government is less honest than its private competitors in crime. At least a thief doesn’t claim to be committing his crime for your own good, to be performing a desirable social service in “the public interest”. No one has the right to point a gun at you and demand your help, your money, whether it be an individual or a govern- ment. There would be far fewer needy people if the gov- ernment allowed us to keep our money and make our own provision for sickness and old age; if it ceased to devalue our money and our savings by inflating the currency; if it stopped making us pay through the nose for its services and allowed us free choice, and if it no longer stifled prosperity and economic growth by its perpetual meddling and be- stowing of privileges such as subsidies and protective ta- riffs. The so-called welfare state is a con-trick. It perpetuates the poverty which the free market would ultimately eradicate. The few who really can’t help themselves would be assisted by the many voluntary charities resulting from the natural co-operation and benevolence which abound in a society based on production, not predation. Who profits and who loses? The mass of ordinary working class people have everything to gain by the abolition of tax- ation; the economic and political parasites have everything to lose. I picked those sections out because this seems to be the standard argument. You start with the dictionary definition of theft, then declare that the welfare state is so inept that you can immediately disqualify any notion that taxation might be seen as social benevolence, and finally, end with the outlandish claim that the primary beneficiaries of an abolished tax code would be “most people”. Also, a reference to “parasites”. This came from the Libertarian Christians website. The trouble is: this argument is really appealing. At least the first part is, because I guess taxation really is a form of expropriation. You only get an indirect vote in what your taxes are, or whether they ought to exist in the first place. And mostly, there’s just a law that says “your tax rate is such-and-such percent of your gross income”, and we all pay it and go from there. It assumes that abolishing the tax code will mean that you’ll still earn the same “gross income”. If you want to live in a country, then you have to abide by its rules. That’s the deal, really. If you don’t like it, then you should leave: because I don’t think that any of us has the right to impose ourselves on a society. Vote for an executive committee who’ll agree to lower the annual subscription (and/or spend it better). Taxes are essentially country membership fees. Sure, you may not like or want all the benefits. In fact, many of the benefits may go to someone else. But if you want general access to the facilities, and the right to call yourself a member and participate in the voting process, then the fees are the fees. Even if you feel like the whole thing is a bit mafioso. When salaries are negotiated, the “tax” portion of your gross salary is generally not a cost to you as the employee – it is a cost to your employer. The negotiation process usually revolves around the take-home component (ie. your net pay), and at the end, the package gets grossed up to account for the tax. If the tax code is abolished, do we think that employers will suddenly go “Oh, well, I guess that all of this tax saving is yours”? Or are they equally as likely to say “Look, we negotiated in good faith for your take-home package. We took the hit for the tax, to make sure that you got your required net number. Let’s divide this thing up.”? And even if that doesn’t happen, and everyone gets a jump in the salary in the short term – in the long term, the level of pay will still come back to take-home numbers (so the rate of increases will slow down for a while, until the take-home number becomes an issue again). As I see it, the real long-term benefit will still accrue to the holders of capital, who are paying less tax on your salary, and paying less tax on their profits. Just to be clear: I’m not saying that taxation is necessarily a good thing. Or even that taxes are necessary. But I am saying that the ‘taxation is theft’ argument seems a bit cheap. Some people have a moral argument for paying tax (see here). Some people question the definition of theft (see here).